DDH Logistics in Heist op de Berg in Belgium is part of the D.Logistics holding whose subsidiaries offer logistics and logistics-related services that are largely provided on a customer- and project-specific basis. Many years of experience from a broad customer base enable them to offer and provide top-quality professional logistics solutions for their customers, together with their customers. Within the wide spectrum of logistics services, they have defined three business divisions in which they are market leaders in some areas: Consumer Goods Packaging, Industrial Goods Packaging and Warehouse Logistics. D.Logistics supply services across all sectors, although we focus on the consumer goods, automotive, mechanical engineering, chemicals and air cargo sectors. In former days DDH Logistics used manual outer sleeves for the loading and unloading of trucks but these forks always were too long or too short. The long forks stuck out the back of the pallets and caused damage to the goods and their packaging, therefore the goods often needed to be repacked. For the lift-truck driver these manual extension forks were difficult to work with as they were very hard and heavy to install. Because of this also from an ergonomic point of view it was impossible to continue to work this way. After a thorough internal analysis we came to the decision to switch over to hydraulic lift-truck forks. Last year we installed KOOI-REACHFORKS® on each of our 15 new EFGD lift-trucks, this operation took place in cooperation with our lift-truck dealer, Jungheinrich Belgium. 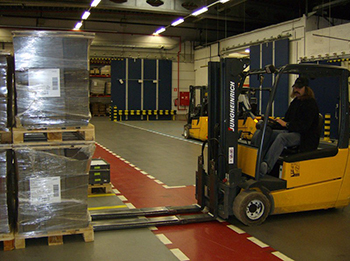 “Now we don’t suffer any damages anymore as the lift-truck driver can adapt the length of the forks to the length of the pallet.”, according to Mr. Eddy Pieck, logistics and prevention manager. Our lift-truck drivers are very satisfied with the introduction of the hydraulic lift-truck forks as they can perform all pallet operations without interruption. During order picking we now have the possibility to transport several pallets at once, sometimes even four pallets, which makes us operate faster and more efficiently. The next project for DDH Logistics is to look for possibilities to implement Meijer Handling Solutions’ RollerForks, the mechanical lift-truck forks for loading and unloading goods without using of pallets.